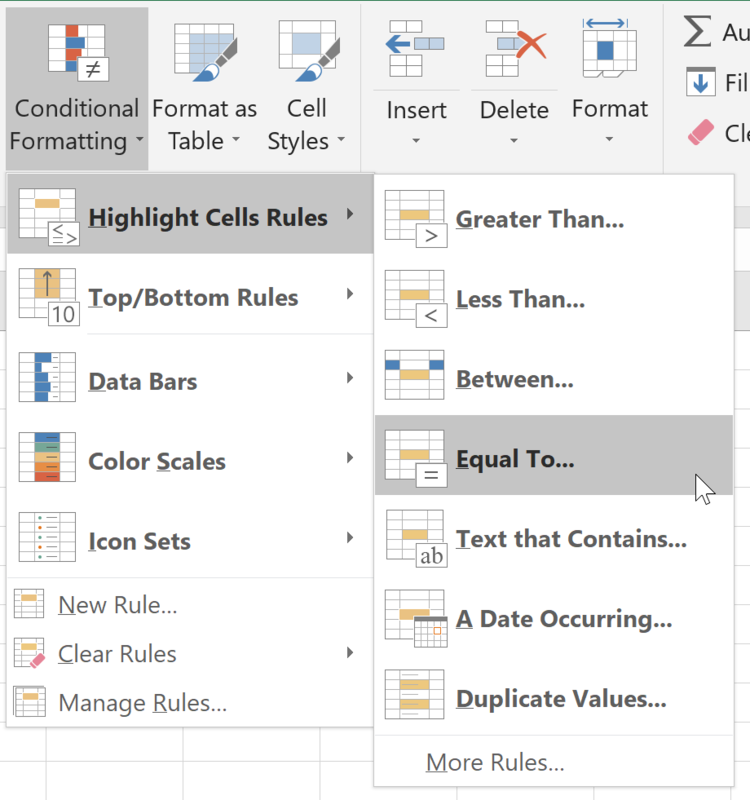 Learn to use conditional formatting to display cells differently based on their values. Learn to quickly format tables using styles. 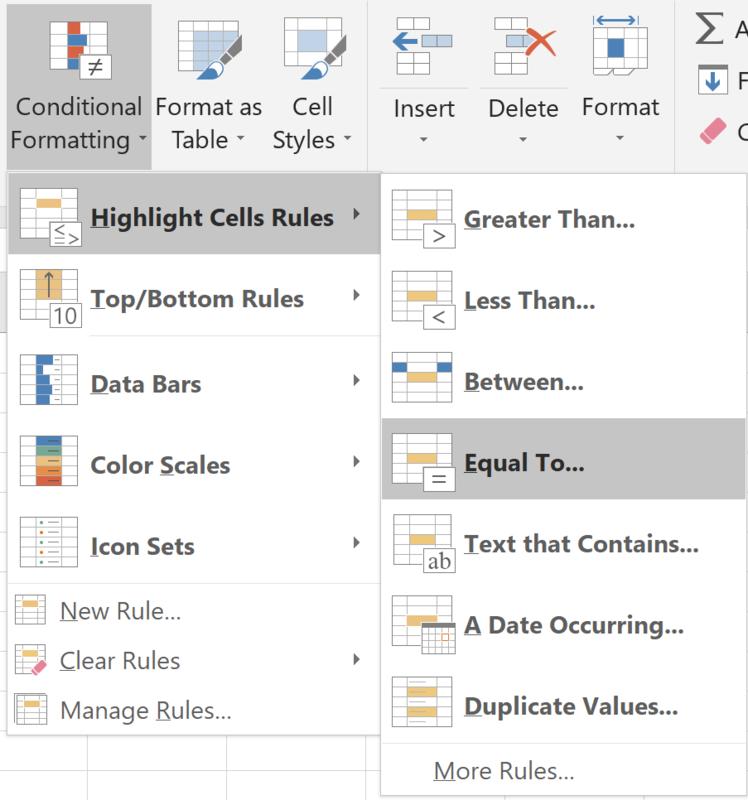 Learn to format cells using styles. Highlighting the highest or lowest numbers in a report. Highlighting numbers above or below a certain number. Highlighting specific values with specific colors. Drawing attention to specific dates. Highlighting cells that contain specific text. Highlighting numbers within a certain range. Visually displaying the values within cells. 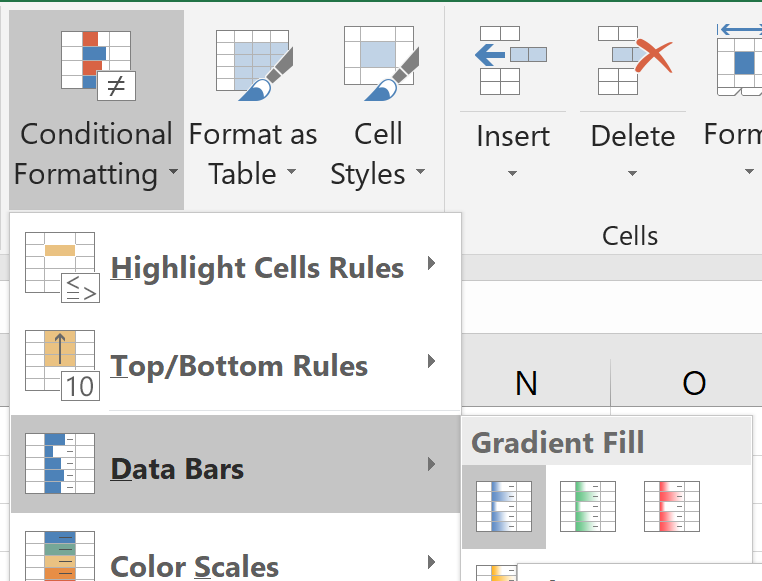 Highlight Cells Rules. Highlight numbers greater than, less than, between, or equal to specific numbers. Also highlight cells that include specific text, dates with a specified range, and duplicate values. Top/Bottom Rules. Highlight the top or bottom X or X% results in a data set, or numbers that are above or below average. Data Bars. 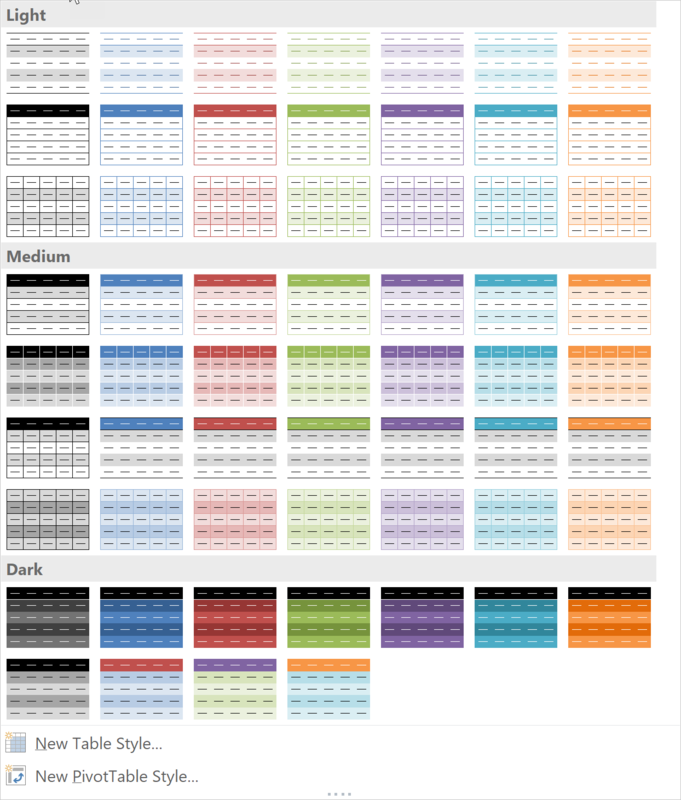 Visually display values by filling portions of cells with colors based on the values. Color Scales. Visually display values by associating cell colors with the values in the cells. Icon Sets. 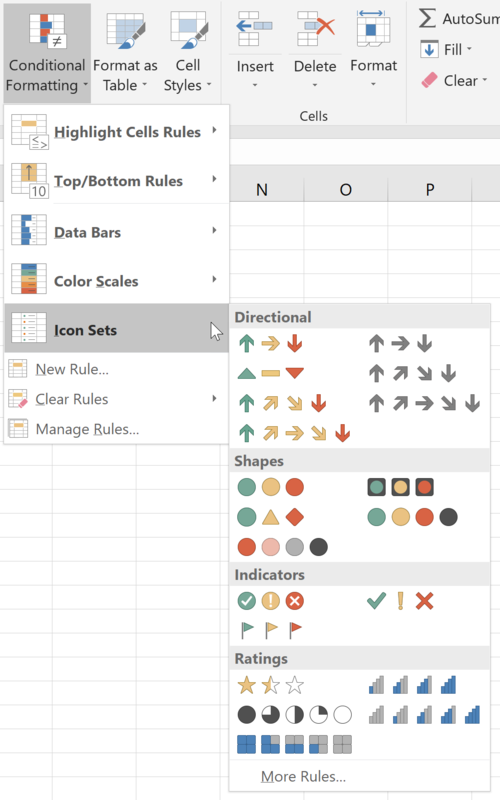 Visually display values using icons. Formatting Based on Values in Other Cells. Formatting can be based on the value within the cell itself or on the value within another cell. 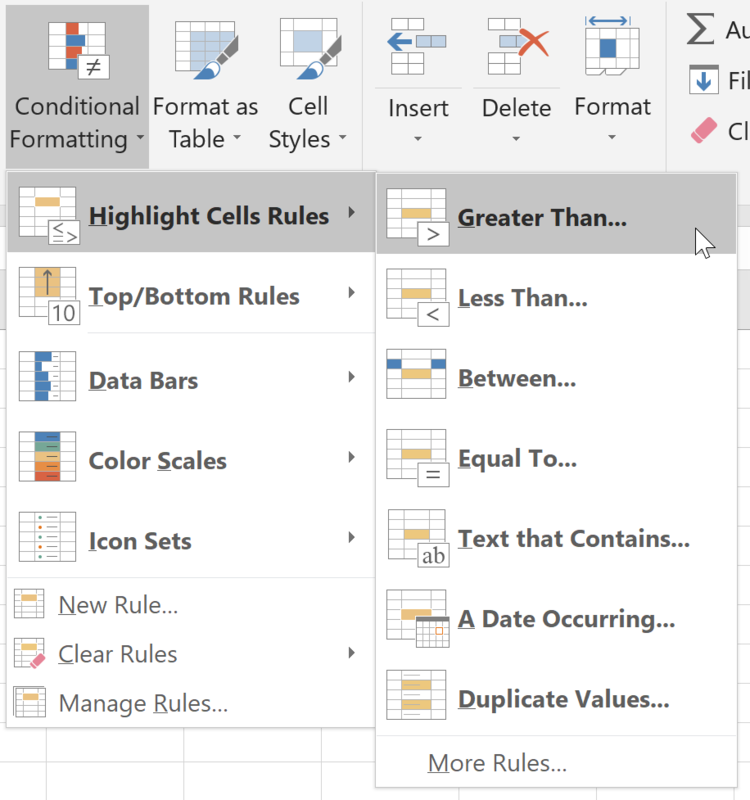 Choose the cell or cells to which you wish to apply conditional formatting. If necessary, fill out the requested information in the dialog box that appears. 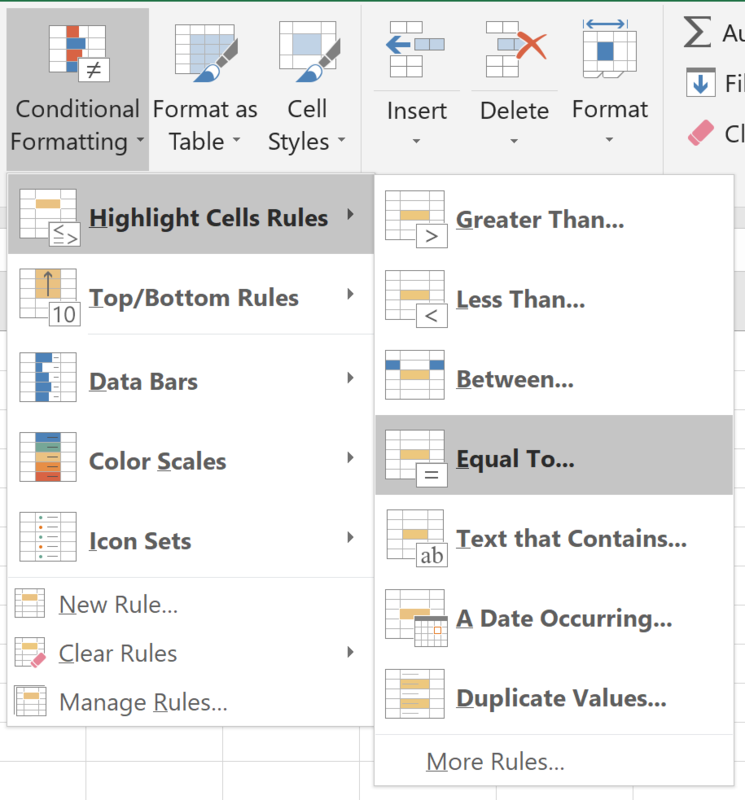 In this exercise, you will practice using conditional formatting in a number of different ways. 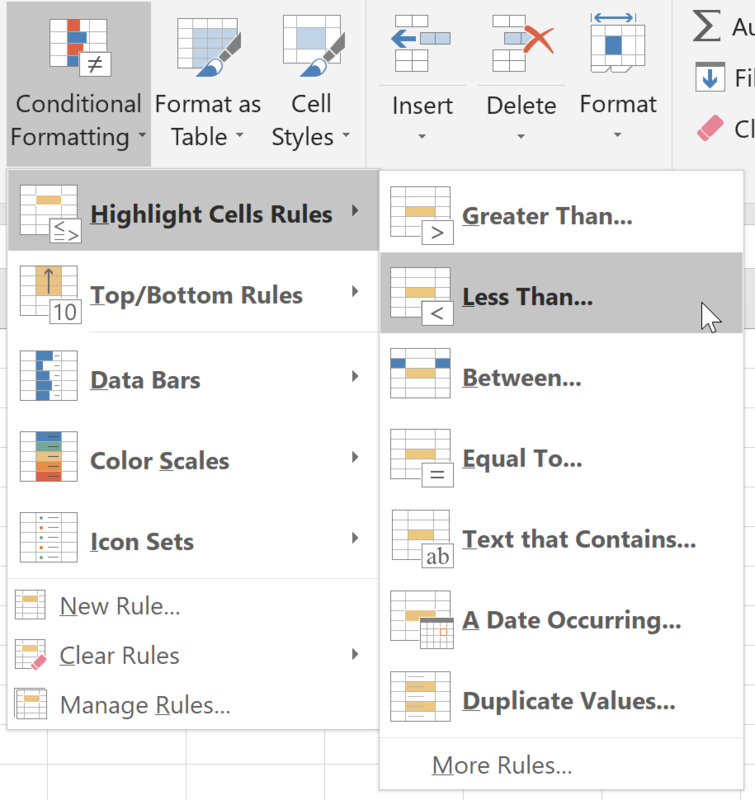 Open Conditional Formatting.xlsx from your Excel2019.2/Exercises folder. In Sheet1, in the Listing Price column, highlight the most expensive 20% of houses using yellow fill with dark yellow text. In Sheet1, in the Town column, highlight all cells containing "Fayetteville" using light red fill. In Sheet1, in the Square Feet column, use blue gradient fill to visually demonstrate the size of each house. In Sheet1, in the Bedrooms column, highlight all cells showing 4 bedrooms using a red border. In Sheet1, in the Bathrooms column, use icon indicators to draw attention to houses that have 1 or 4 bathrooms. In Sheet2, in the Date Due column, highlight all past dates in light red fill with dark red text, current dates in yellow fill with dark yellow text, and future dates in green fill with dark green text. Tip: When creating the rules, instead of entering today's actual date, enter "=today()" (do not enter the quotation marks). In Sheet1 in the Listing Price column, highlight the most expensive 20% of houses using yellow fill with dark yellow text. In Sheet1, in the Bedrooms column, highlight all cells showing 4 bedrooms with a red border. In Sheet2, in the Date Due column, highlight all past dates in light red fill with dark red text, current dates in yellow fill with dark yellow text, and future dates in green fill with dark green text. 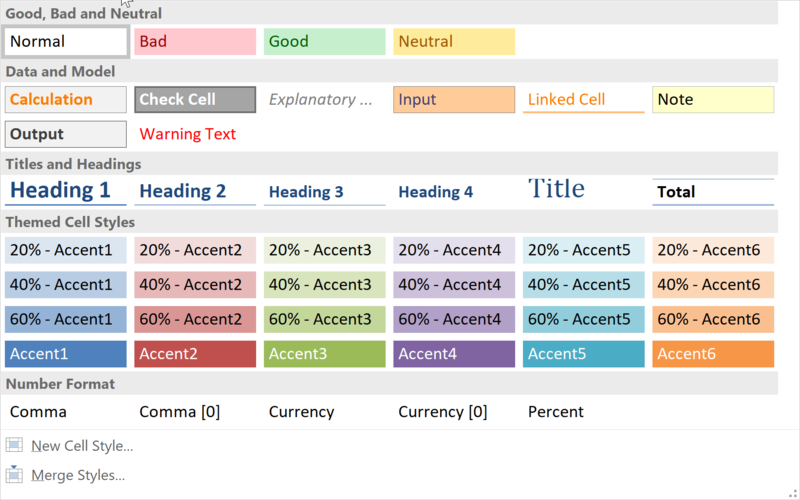 Styles can be applied both to tables and to individual or groups of cells. Styles can also be applied to charts and illustrations, though applying styles to charts and illustrations is not covered in this lesson. Select the cells you wish to convert to a table. If you select just one cell, then Excel will guess which other cells you wish to include and will ask you to verify. Note: Lists can also be converted to tables using the Table command on the Insert tab. This is covered in the lesson on working with lists. Select one of the styles by clicking on it. Select the cell or cells to which you wish to apply a style. Select one of the options from the drop-down list by clicking on it. 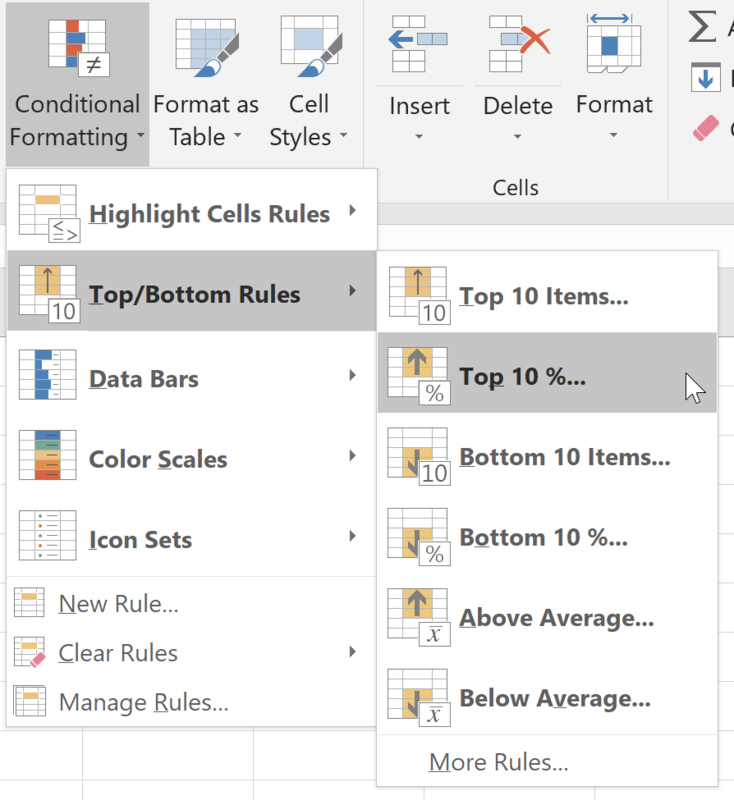 When you save a style, it is then available in the Custom styles category, appearing on the Cell Styles menu when a worksheet contains relevant cells. In this exercise, you will convert data to a table, change the format of the table, and format cells. 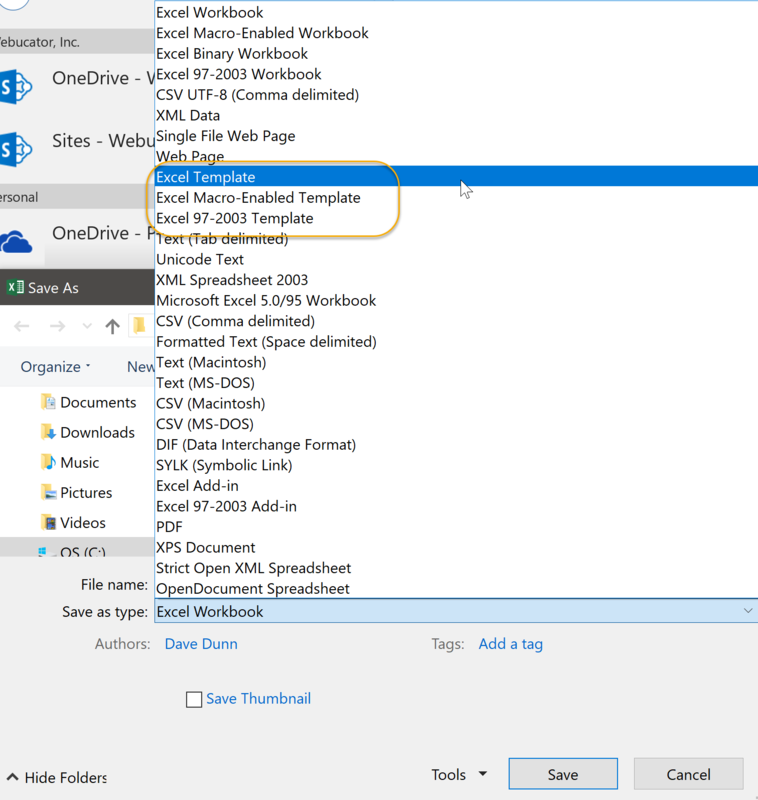 Open Styles.xlsx from your Webucator/Excel2019.2/Exercises folder. 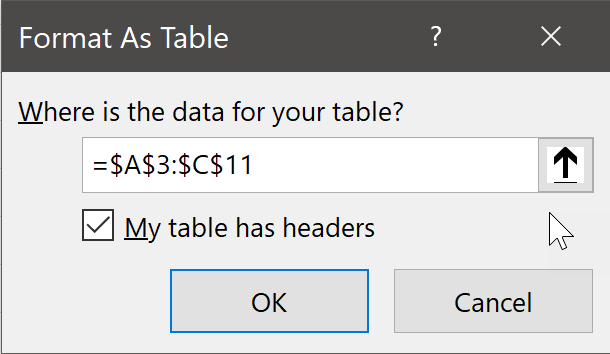 Convert the data in cells A3:E8 to a table using one of the Light styles. 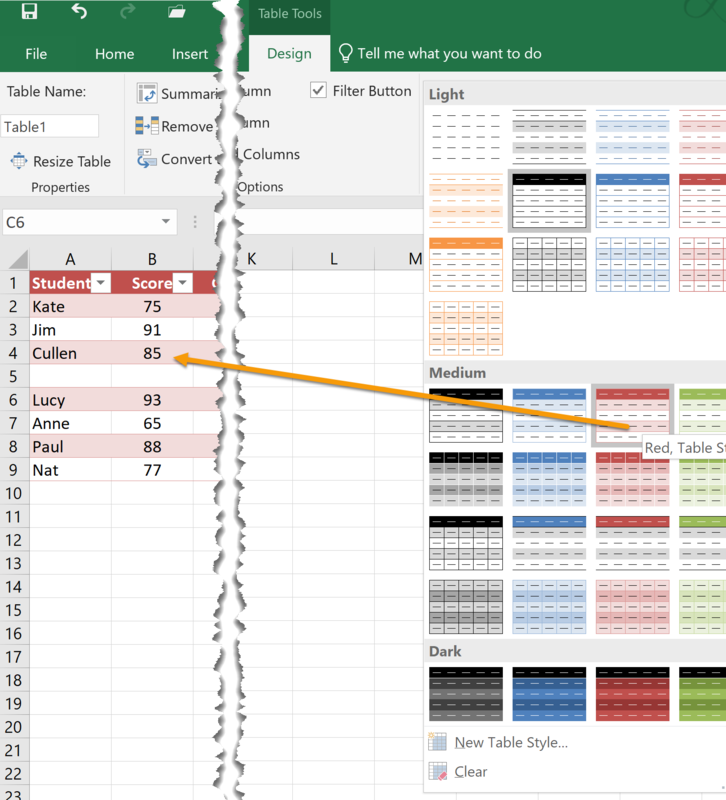 Change the format of the table to one of the Dark styles. Apply a cell style to cells A1:C1. 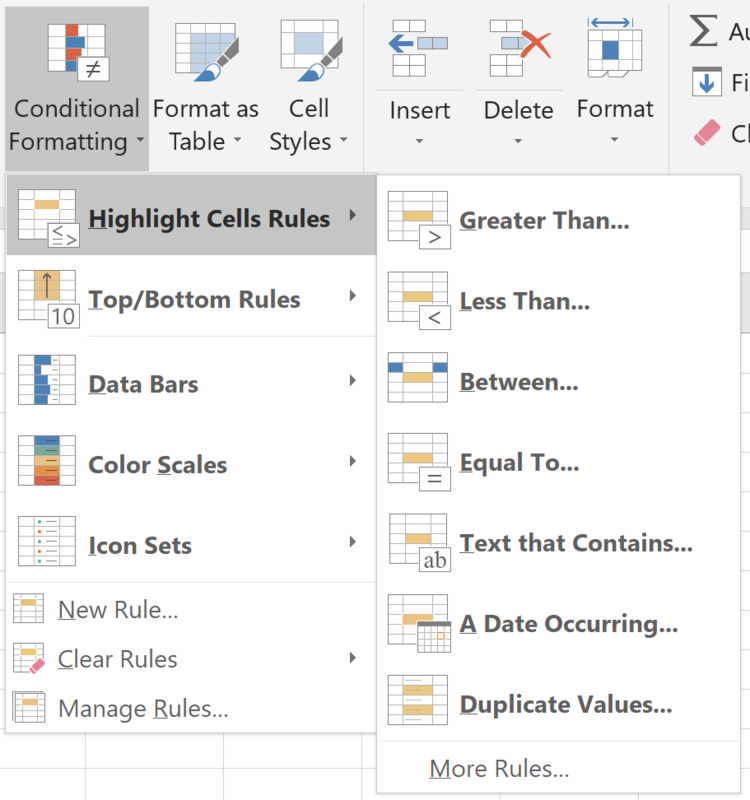 Convert the data in cells A3:E8 to a table, using one of the Light styles. Select the File menu tab and then click Save As. Navigate to where you want to save the template by clicking Browse. In the Save As dialog box, from the Save as type drop-down list, select one of the template options. Click Save to save the template (by default, it is saved in the following location: C:\Users\user name\Documents\Custom Office Templates). Select the File menu tab and then click Open. Navigate to the C:\Users\user name\Documents\Custom Office Templates folder. Open the template you wish to modify and make changes. From Backstage view, select Save As, and then from the Save as type drop-down list, select one of the template options.